We have a litter November 13 2018. Turn to page kittens. We started this cattery in 2011. We live in the city Sneek, in The Netherlands. 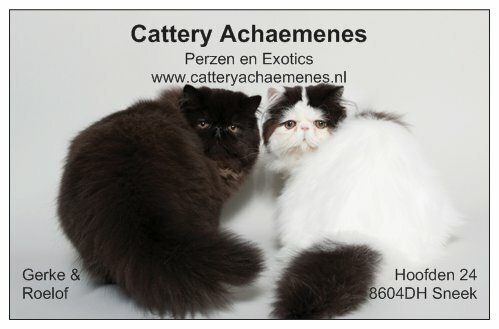 The most important reason of breeding is to keep the race of the Persian cat in good condition. From 2016 our breedingcats are going to be tested on PKD DNA, HCM and FIV-FeLV before they are mating. For more information on this case please visit the page Health. Our kittens will be raised up like "normal cats". They will walk everywhere in our house and grow up with other cats. Kittens being sold with a contract to breeders or housecats. On the left of this website you find a schedule of shows in the Netherlands from the clubs: Mundikat and Felikat. <Click here> why we made the choice for the name Achaemenes. We wish you a pleasant visit on our website. The owners Gerke Jongstra en Roelof Udinga.